Burial Mounds and ritualized mortuary practices were an integral part of the Hopewell culture. The mounds suggest a highly ritualized and very organized society. Burial mound construction varied depending on its regional location. The mounds at Albany are typical of the Illinois region. Over 96 mounds were built at Albany during the 500 year time span from 200 B.C. to A.D. 300. The Albany Hopewell built their mounds on the bluff tops above the village and on the terraces adjacent to the village. Today about 50 of the mounds remain. Some were destroyed by agricultural activities and by railroad and highway construction, others were destroyed in the process of being scientifically excavated in the early 1900’s by the Davenport Academy of natural Sciences. Mound construction was fairly uniform. First the topsoil was cleared away. A tomb was constructed either on the surface or placed in a pit dug into the subsoil. 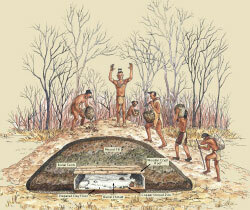 The tomb was constructed of stones, plaster, or logs; and the tomb floor was covered with mats of skins, bark or reeds. Over time, or at a designated time, the tomb was filled with the remains of individuals and artifacts. Finally, logs, sometimes covered with flat stones, would cover the tomb and its remains. Covering the tombs with heaping basketfuls of earth completed the mound. Not all burial mounds were alike. They varied in size, number of burials, and even shape. Some individuals were e buried with accompanying grave goods. Others in the same mound were buried with little or nothing besides them; however, perishable artifacts such as wood and clothing would disappear long before modern time. Crafted artifacts found in the excavated mounds include stone tools, copper awls and panpipes, mica mirrors, galena, marine shell containers, platform smoking pipes, and pottery. The majority of the mounds found here are conical in shape; some are linear or oval, and 2 are conjoined conical mounds. Each mound ranges from 32 feet to 1 foot in height, with a diameter range of 200 feet to 15 feet. The average size is 3 feet in height and 40 feet in diameter.